The trains of Japan are the apex of its hospitality. A woman is leaving an Adore store in Omotesando Hills. Heels clacking, confident stride, bag with new shopping item over her right shoulder. As she walks towards the exit of the mall, a saleswoman stands in the doorway to her shop. She bows, deeply, for seconds. The customer does not see it. Japan might be the most hospitable place on this planet. Encounters at hotel desks and Seven Elevens are of a kindness, feigned or not, that is almost incomprehensible to this unmannered Dutch visitor. ATMs present you with they yens, offered not through a slot in the wall but through a large slot in the bottom of the machine, which opens up to showcase the cash as a little melody plays. The ATM is part of the Japanese urban soundscape. Everywhere around you are jingles and tunes, soothing and nimble, ushering you to keep in the pace of the city with magnificent grace. The best thing is the music that plays when trains depart from Tokyo’s subway and JR stations. They’re called hassha merodi or eki-melo, melodies for train departure. Each station has its own melody, which plays as the train doors close. The songs are often appropriate to their location. In Ebisu, a Tokyo suburb named after the beer Yebisu, the melody is the same as that used in beer advertisements. One of the composers for the melodies, Minoru Mukaiya, knows the psychology behind these tunes. “There is a huge number of people who take the train in the metropolitan areas such as Tokyo, Osaka and Nagoya and it’s necessary to get people on and off in a short time,” he told ABC. His melodies gently remind people of the urban rhythm they are a part of. Through these sounds, familiarity in the city quickly becomes an aural matter. You learn to recognize the melody of your home station, your transfer station, or of a place you don’t know, but like the tune of. I wasn’t planning on exiting the train at Ikebukuro but its song, “Springbox”, made me feel for 10 seconds as if I was in an old JRPG, so I got out and walked around there anyway. 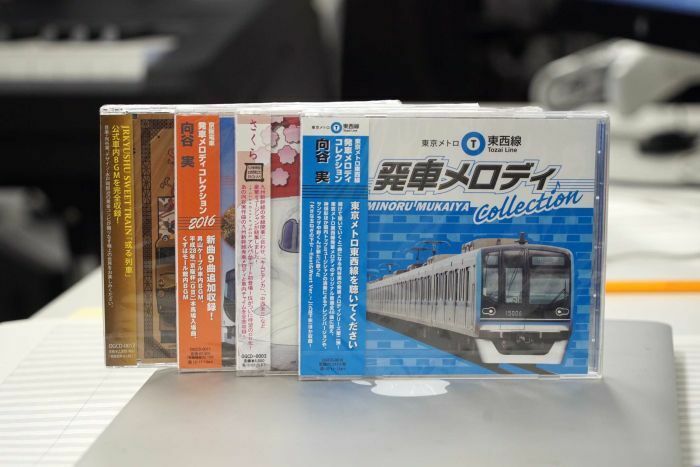 The eki-melo are much loved: train fanatics, densha otaku, travel across the country to record them, and there are entire websites devoted to them. It makes sense: the ebb and flow of these songs perfectly summarizes the Tokyo imaginary: its comings and goings of millions, every day, in the same underground passageways. And more than that: to always be in motion, among the crowds, and to feel convivial with them. The best example of that are all the businessladies- and men folded in their chairs, sleeping on the trains from working overtime. It’s safe to be in motion. 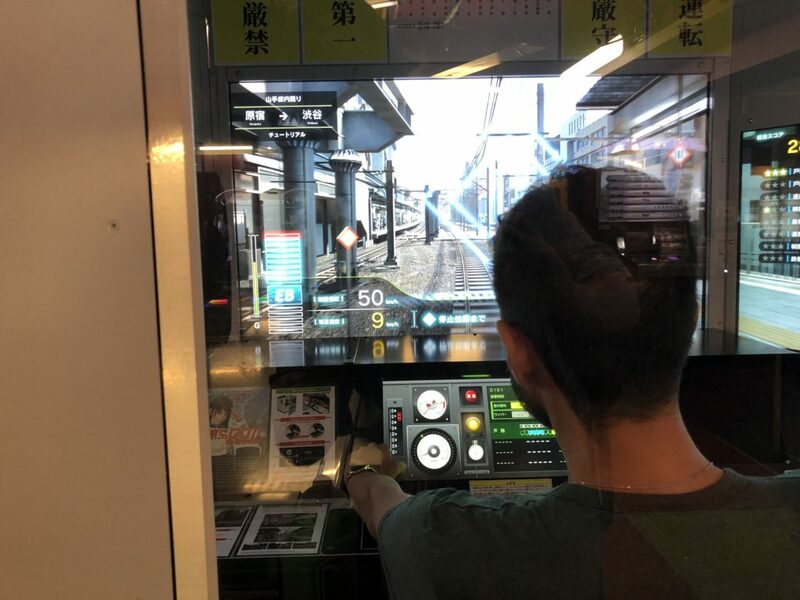 In VR Park Shibuya, I find a proper train simulator. It has proper conductor controls and a three-monitor system that makes you feel you are actually controlling a train. It’s called Densha de Go!, and the series has been around since 1996. It simulates Japanese rail systems. With an unbearably slow pace, I direct mine from Shibuya to Ebisu. The melodies, unfortunately, are missing. Scripted Journeys is a blog on travel and technology. It is run by Tom van Nuenen, PhD.